Hang it from your tree or give it as a gift. Some sewing required to assemble. A nice dove to hang on the tree with your other Christmas baubles. 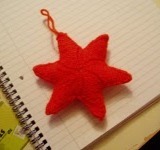 It looks a little off kilter in the picture, but I think that's just a case of prodding the stuffing into shape. 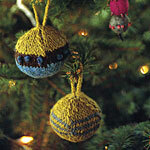 Love these knit cube-shaped presents for the tree! 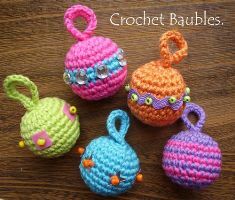 Very simple round knit baubles to grace your tree. 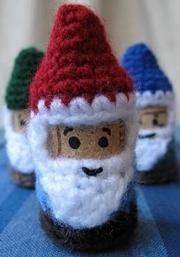 I don't know how to knit, but they look easy. 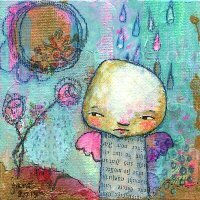 I sooo love the bright and cheerful colours that Mandy McKenna has chosen for her baubles here. It's lovely to see something that's not red & green for Christmas for a change. A very clever idea from Lucy Ravenscar. And one that looks very Christmassy, too. Make a few for your kids and their friends! 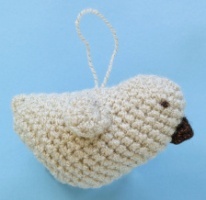 Lucy has a range of patterns for cork-and-crochet creatures that you can share at her blog.